Under the guidance of the County Board of Road Commissioners, KCRC continually strives to improve outreach to the public we serve. One important component of this objective is to provide access to information. The Performance Dashboard, below, serves to underscore KCRC’s mission to enact accountability through transparency. The Kent County Road Commission Strategic Plan provides a comprehensive assessment of the organization and serves as the foundation of how KCRC works to ensure the safety of its network and what is needed to improve deteriorating assets. Simply put, the Plan serves as a blueprint from which KCRC can define objectives, deliver services and develop improvement plans. In 2015, the Plan was honored by the County Road Association of Michigan with the IMPRESS Award for Excellence in Operations. Over half of the Kent County Road Commission (KCRC) Operating Revenue comes from the Michigan Transportation Fund (MTF); these revenues are primarily generated from fuel tax and vehicle registration fees. Other significant KCRC revenues include federal and state grants for specific road and bridge projects as well as KCRC’s contract with the Michigan Department of Transportation (MDOT) to maintain the county’s interstate freeways and state highways. KCRC does not receive any General Fund tax revenue from Kent County. On November 10, 2015, Michigan Governor Rick Snyder signed a seven-bill package to provide an increase to the state’s investment in transportation. The package will be phased in over a five-year period, beginning in 2017, and is projected to provide a statewide annual increase to transportation funding of approximately $1.2 billion when fully implemented in 2021. The increase will be distributed through the MTF to state and local governments and county road commissions. By 2021 and thereafter, KCRC is projected to receive an additional $22.1 million annually with this package. From 2014 through 2016, Michigan Legislature provided an additional allocation for transportation agencies from the state’s General Fund that allowed KCRC to increase investment in Construction and Preservation. As the state’s new funding package begins its phase-in in 2017, KCRC will dedicate the increase to road improvements, seeking to increase investment in Construction and Preservation as well as Routine Maintenance. An increase in “Other Expenditures” since 2012 equates to the increased investment in Capital Outlay, specifically the replacement of trucks, the purchase of which had been reduced during several years of budgets cuts prior to 2012. KCRC has created a multi-year Capital Improvement Plan that prioritizes needed facility improvements and scheduled replacement of equipment. Encompassing nearly 2,000 miles of roads and 172 bridges throughout 21 townships, the KCRC network is diverse. Its corridors include both paved and gravel roadways, connecting agricultural and rural regions to highly-populated urban areas. Unlike many other counties in Michigan, all of KCRC’s primary roads are paved. 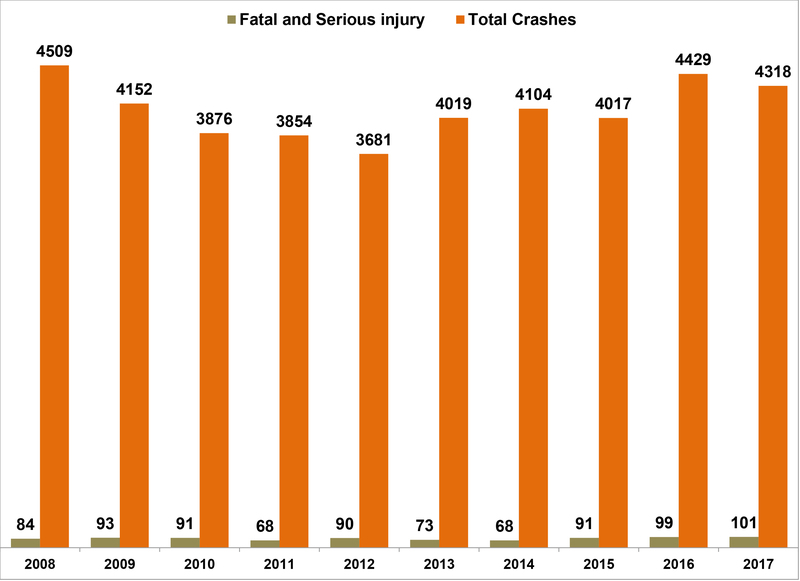 From 2005 to 2015, KCRC experienced a steady decline in its primary road condition ratings, due in large part to the reduction in services and road improvements caused by a combination of decreases in MTF revenue and increases in costs. With the implementation of the new funding package, by 2021, KCRC plans to double its annual investment in primary road construction and preservation and expand the network’s number of all season roads. 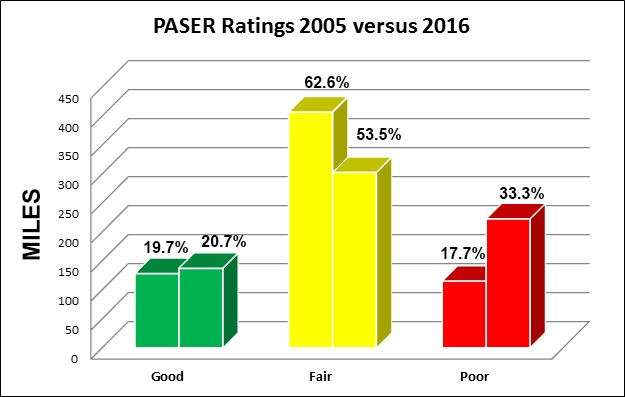 KCRC’s objective is to restore primary road condition ratings to 90% rated Good or Fair. KCRC shares responsibility with Townships for the funding of construction and surface improvements on local roads. KCRC transfers 30% of its MTF revenue, the maximum allowed under Act 51, to local roads. A portion of these dollars help fund the Township Matching Program which combines investment from KCRC and the Townships to fund major and minor construction projects. The new transportation funding package will allow KCRC to increase investment in local roads. 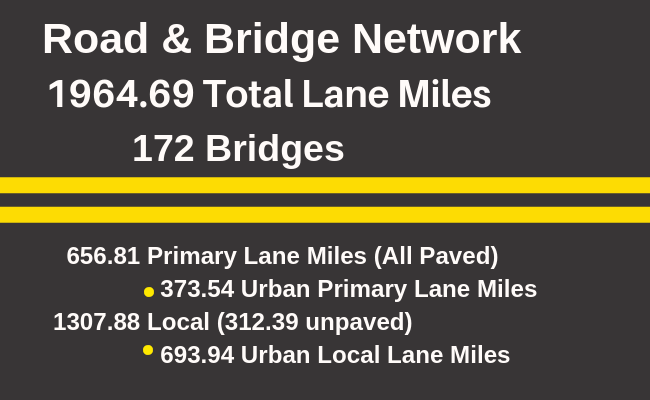 As of 2017, 100% of KCRC’s 172 bridges are classified in good or fair condition. *Functionally obsolete means the design is outdated such as having narrow shoulders and low clearance underneath. Those interested in comparing road condition data among other agencies throughout the State of Michigan may visit the Transportation Asset Management Council (TAMC) for the State of Michigan. The TAMC provides performance data for the 600+ Michigan Road Agencies who complete annual reporting requirements in accordance with Act 51. ​Number of employees, job classification, wages and ranges. ​Annual certification for compliance to Section 18j(1) of Public Act 51 of 1951, MCL 247.668j(1). Report provided in accordance with Public Act 202 of 2017.